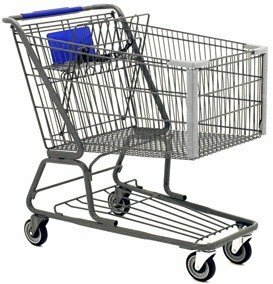 Am I the only person that constantly gets electric shocks when pushing a shopping cart? I'm not talking about one zapp of static electricity, I am talking about semi constant mini shocks that are so uncomfortable that I can't keep my hands on the shopping cart handle. I always wear rubber soled shoes. I do not drag my feet when I walk, either. I did a little research while I was writing the blog, and yes, there are other people who experience this too. One suggestion was to touch the metal doorframe when you enter a store so you can discharge some electricity before touching the cart. I guess I'll try it. What do YOU think? I think that it is caused by fluctuating eddy currents. Never heard of it. Poor you! Actually I am still rejoicing over your apple pie winner status! Yay Karen!! !